All Singletrack subscribers are enrolled in our Premier user benefits club. Firstly, it gives you access to all the offers and discounts from the plethora of bike related businesses you see below. Just flash your credentials at the counter or follow the instructions on the relevant websites to claim your discount. Secondly, you get access to discounts of up to 20% off eligible product in our online shop. We now have an iOS App for helping you quickly find our Premier Dealers for your iPhone and iPad, which takes care of all your Premier Subscriber needs. 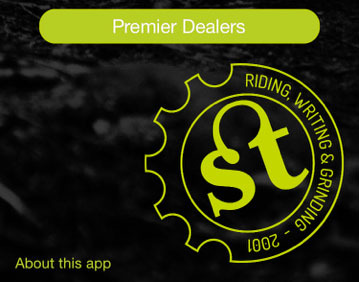 Download the Premier Dealer App now! 5% off non sale stock and special, guided ride deals for subscribers. See Jersey's best riding with us! Calle San Rafael, 11 Local 4, 03580 L'Alfàs del Pi, Alicante. Spain. Offer for Singletrack readers our CostaBlanca Enduroland T-shirt plus a surprise gift. Leave a comment "Singletrack Premier Subscriber" while booking your tour at www.czechmtbholidays.com and we'll be happy to prepare an exclusive gift upon your arrival: Gift pack with a selection of ten excellent Czech beers! EXCLUSIVE for Singletrack Subscribers: voucher code on the Scott Scale 920, get an additional £10 off. SINGLETRACK920 This is currently set to run until the end of April. Singletrack subscribers receive a 5% discount for adult bookings, and a bottle of local cava to celebrate your arrival! 10% off all saddle bags, code STpremier. Bundles and accessories not included. On booking a holiday with us, Singletrack Premier Subscribers will receive one of our Pure Mountains enduro jerseys, worth £50 / €65. They are available in men's and women's versions, in a variety of sizes and are made in the UK by Flare Rider Co (men's) / Flare Clothing Co (women's). 5% off the trip price per person on any of our trips, and a massive 50% off the trip price of a group leader who organises a group booking of 4 or more. 10% discount for Singletrack Premier Subscribers on all bikes, clothing and accessories, excludes sale bikes and bike to work schemes.